I have a cold and it's rainy and miserable so here's my tried and true leek and potato soup recipe. Melt the butter in a large soup pan and leave on low heat. 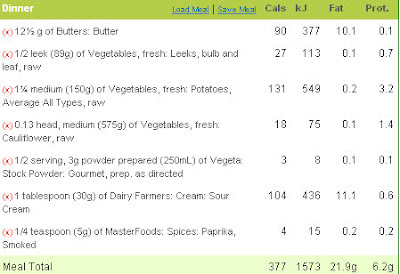 If serving to lactose intolerant guests be sure to use a dairy free margarine. Cut the leeks into small rings, about 1/2 cm in height. Add to the pan with the garlic crushed and fry until the leeks are soft. Peel and cube the potatoes into 1 cm cubes and add to the pot, stir fry with the leeks until the cubes are warm. Cut up the cauliflower into inch cube pieces, be sure to include the stem as well as the florets and add to the pot. Cover the vegetables in the stock and top up with water so that the califlower floats above the potatoes, turn to Medium - High heat. Bring to the boil and then return to Medium heat, leave simmering until the potatoes and cauliflower are soft and lose structural integrity. Take the soup pot off the heat and use a "stick" blender to puree the vegetables. The soup should be as thick as custard, if you have added too much water return the soup to simmering heat and boil off some of the liquid. Serve the soup into bowls, add a dollop of sour cream to those who eat it and sprinkle heftily with smoked paprika. Best eaten with crusty white bread. If you are not keen on cauliflower replace with another 2-3 potatoes, to bulk out the recipe add 1-2 onions and fry with the leeks. To make this recipe vegan/non dairy replace the butter with soy based margarine and omit the sour cream for serving, the soup is strong enough on its own to stand without it. That is just the ticket for this rainy weather!